Here in Texas, we know that border walls are effective. President Trump saw that firsthand on Thursday, but the ones who really need to see it are the Democrats. The President has shown incredible fortitude in holding out to get us the 234 miles of barriers that law enforcement professionals tell us are necessary to secure the U.S.-Mexico border. I was proud to welcome him to Texas when he came to tour an existing section of the border wall. I only wish he had been here to celebrate Democrats in Congress doing the right thing and providing the funding to build the wall along the many unprotected portions of the border. 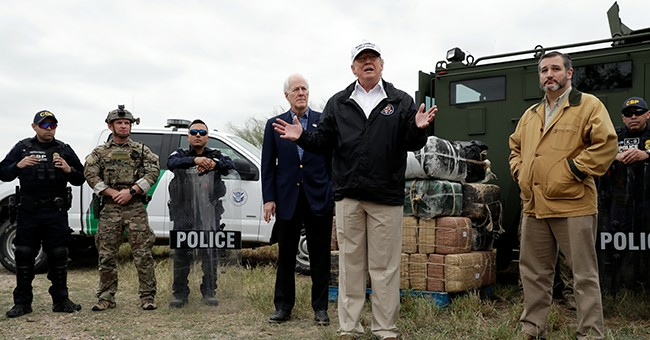 Instead, President Trump, Senators Ted Cruz, and John Cornyn, Attorney General Ken Paxton, and I listened to our Border Patrol agents brief us on the problems they continue to face. They’re clearly distressed by the knowledge that those problems will remain unaddressed until Democrats abandon their obstructionism or President Trump exercises his legal authority to declare a national emergency. These agents put themselves in harm’s way every day to apprehend more than 300,000 illegal aliens every year in Texas alone, in addition to another 200,000 in other states. It frustrates them to know that despite their valiant efforts, they’re only catching an estimated 20-25 percent, with the rest managing to slip past them every year because Congress won’t fund the border security measures they need to do their jobs effectively. At a roundtable briefing with the President after our visit to the border, we received a stark reminder of just how important border security is when Reggie Singh recounted the tragic murder of his brother, California police officer and first-generation American citizen Cpl. Ronil Singh, at the hands of an illegal alien with a criminal record. Understanding President Trump’s unwavering commitment to secure our border, there’s only one reason that the crisis on our southern border hasn’t been addressed: Democrats, led by Senate Minority Leader Chuck Schumer and House Speaker Nancy Pelosi, have decided it’s “immoral” to protect America’s borders with walls, so they’re keeping the government closed in an effort to stop it from happening. The Democrats simultaneously claim walls would be “ineffective,” but that’s not what we heard from the men and women who actually patrol the longest unsecured sections of the border here in Texas. We know that physical barriers work because walls just like them have already proven invaluable along more than 100 miles of the Texas-Mexico border. Areas protected by walls in Texas have seen massive drops in illegal crossings and improvements in quality of life, just as we’ve experienced in areas protected by similar barriers in California and Arizona. Our law enforcement experts have already identified the next part of the Texas border, stretching roughly from Brownsville to Falcon Lake, where we can achieve the same success with a portion of the 234 miles of new wall. Border Patrol agents there did not mince words when President Trump paid them a visit Thursday. They have some barriers, but they need more, and they need them now. Tax-and-spend Democrats are pretending that they’ve finally developed a fiscal conscience over the cost of wall construction, but the $5.7 billion President Trump is asking for pales in comparison to the cost of allowing the current lawlessness to continue on the border. If the walls reduce illegal immigration by just nine percent, they will have paid for themselves more than twice over in only 10 years. And that’s not even counting the benefits of curtailing the flow of illegal drugs, literally tons of which come across our unsecured border every year. Here in Texas, when our border security professionals tell us they need a certain tool to combat human trafficking, drug smuggling, and mass uncontrolled migration, we give it to them. Over the last four years, Texas has devoted $1.6 billion to border security, and we plan to keep up that pace with an additional $800 million over the next two years. It baffles me that Democrats who are 1,500 miles away in Washington think they know what is needed for true border security better than the people who live and work along the border. Not every mile of the border needs a wall. Some areas are so naturally impassable that Border Patrol can do without a physical barrier. Nor is a wall going to solve the border crisis on its own. Just as important are the other items President Trump and law enforcement have asked for, such as 75 new immigration judges to work through the years-long backlog of asylum cases. But some places, like Southeastern Texas, will never be secure without an actual border wall — an impassable barrier. It’s time for congressional Democrats to give Texas and the other states along our southern border what we need to protect ourselves. If they don’t provide the funding for a border wall soon, President Trump’s only option for addressing the illegal immigration crisis will be to declare a national emergency and get the job done without them. Dan Patrick has served as the Lieutenant Governor of Texas since 2015, and has long been a strong advocate for securing America’s borders.